2. FORMAL STRUCTURE: Chiron Institute for Psychodrama Practices has a formal structure of society. All training members of the institute are also members of the Bulgarian Association of Psychodrama and Group Psychotherapy. 3. HISTORY: Chiron Institute for Psychodrama Practices has been founded in 2009 by four psychodrama trainers: Svetlana Nikolkova, Milena Mutafchieva, Anzhela Hristoforova and Georgi Dobrinov. They formed a board and elected as a chairman Dr. Med. Svetlana Nikolkova. Svetlana Nikolkova had finished her psychodrama education in 1998 and her trainer was Jorg Burmeister. Trainer of the other members of the board in the past was Dr. Svetlana Nikolkova and they finished their education in 2006. Before the establishment of the Institute, all four trainers had worked as psychodrama therapist and trainers in Bulgarian Psychodrama and Group Therapy Society, which is the national accrediting organization and unite all the specialists in the field. Dr. Svetlana Nikolkova was member of the Board of Bulgarian Psychodrama and Group Therapy Society for 8 years and now she is a member of the Standard committee. She was one of the founders of Bulgarian Psychotherapy Association. Nowadays, Milena Mutafchieva and Georgi Dobrinov are members of the Board of Bulgarian Psychodrama and Group Therapy Society. In 2010 the institute accepted another member - Katerina Ilieva, who graduated as a psychodrama therapist in another Bulgarian psychodrama institute “Psychotherapy 2000” and her trainer was Evgeni Genchev. Katerina Ilieva became a psychodrama trainer in 2011. On 11.07.2011 another member, Plama Hristova, passed successfully the final exam and became psychodrama therapist. Members of the Institute are also Vesselin Somlev and Valentina Peteva, psychodrama assistants; all of them experienced professionals actively applying psychodrama method within Chiron institute and in their professional field. 4. TRAINING PROGRAM: Minimum duration of training is 5 years. Total hours are 1400. The minimum contact training hours is 720. The minimum contact training hours is 1200. The minimum number of psychodrama practice is 200. 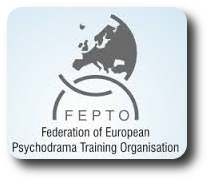 The minimum duration of the psychodrama training is 5 years. One hour is 45 minutes pure PD work from actual start till the end. 5. LIST OF TRAINING STAFF: Dr. Svetlana Velichkova Nikolkova, PhD in Medicine, Assistant Professor in Psychiatry, Psychodrama Director, Psychodrama Trainer, Psychotherapist with Jungian orientation. Milena Miteva Mutafchieva, PhD in Developmental Psychology, Assistant Professor in Psychology Program, Department “Cognitive Science and Psychology”, New Bulgarian University, Psychodrama Director, Psychodrama Trainer. Anzhela Tsvetanova Hristoforova, MSc in Social Psychology, Psychodrama Director, Psychodrama Trainer Georgi Dobrinov Georgiev, MSc in Clinical and Social Practices, Psychodrama Director, Psychodrama Trainer. Katerina NikolovaIlieva, MSc in Clinical Psychology, Psychodrama Director, Psychodrama Trainer. 8. CODE OF ETHICS: Yes. Chiron follows FEPTO and Bulgarian Psychotherapy Association Codes of Ethics.